Normally, I take over the kitchen. I’m usually trying out new ingredients or possible new items to sell in the shop, or preparing for an upcoming television food segment here in St. Louis. But, on that rare occasion, my husband will step in the kitchen and take the helm. Today is one of those times! We are opposites as cooks. In a nutshell, he measures and follows the recipe, and I am an improviser and see recipes as “a place to start”. With this cold weather, Christmas Carols on in the store, and the Christmas Traditions lights up all around St. Charles, it’s definitely slow cooker time. 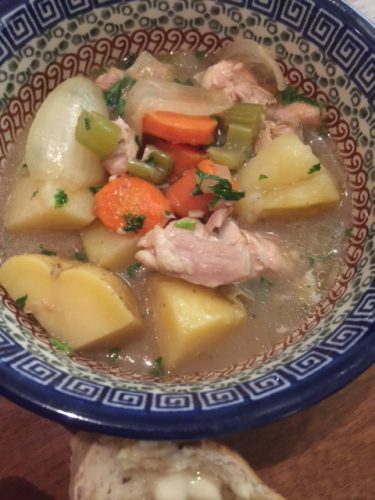 He fixed a delicious chicken stew tonight and the aroma has been teasing us this afternoon! He’s not a soup person so much…he has a large handlebar mustache, and well, let’s say that soup requires a lot of napkins for the mustache! Thick stews and chilis seem to go better. Here’s what we are eating for dinner tonight- why not try it for yourself? Heat the cooking oil in a cast iron or heavy skillet. Salt and pepper the chicken pieces. Place the chicken pieces in the heated and oiled pan, lightly brown on all sides and remove from the skillet and move to the slow cooker. Next take the onion, carrots and potatoes and put in the hot skillet to pre-cook a little until the onions are translucent and absorb some of the chicken flavors. Remove from the skillet and move to the slow cooker. Remove the skillet from the heat. Take about 2 cups of the prepared broth and add to the skillet. Use a spatula to scrape up the “brown bits” from the bottom of the skillet and pour the enhanced broth in to the slow cooker. Take ½ of broth in a small cup or bowl and add in the flour. Whisk until smooth and add to slow cooker- this will help thicken the liquids in the stew. Add all remaining broth. Add garlic and bay leaf. Simmer on high for 1 hours on high, then move the temperature to low for 2 hours, testing the carrots and potatoes with a fork for doneness every 30 minutes after 2 hours. When veggies are done, remove the bay leaf and discard, add fresh parsley, turn slow cooker off and ladle in to bowls. Suggested to serve with a loaf of warm bread and butter.